One of the many misconceptions about our national parks is that visiting means contending with the masses along crowded paved roads, with the only chance for solitude limited to trails that are beyond the abilities of many visitors, including the elderly, those with limited mobility or young families. But the truth is that our national parks also feature some of the most stunning primitive backroads for those looking for a more accessible way to get off the beaten track. One of the most spectacular is the Titus Canyon Road in Death Valley National Park, and the concept behind Titus Canyon has stuck in my mind since I first visited the park in the early 1980s. Titus Canyon: Yogi Bear does not drive here! Titus Canyon Road begins east of Death Valley, at the near-ghost town of Rhyolite, climbs over 5,000 foot Red Pass, then begins a spiraling descent of nearly a vertical mile as it enters the increasingly narrow gorge of Titus Canyon. When the road finally emerges near sea level, from the east wall of Death Valley, the floor of Titus Canyon has shrunk to a point that two cars would not be able to pass. This is where the genius of Titus Canyon Road comes in. The Park Service has designated this a one-way road, with traffic allowed only in the direction of Death Valley. The physical constraint at the lower end of Titus Canyon is the determining factor, to be sure, but the broader effect is that one-way traffic provides a remarkably relaxing experience in which visitors can focus on the scenery, not dodging oncoming traffic. The one-way design also negates driving through clouds of dust from oncoming vehicles, a notable benefit on primitive roads. So, how does this relate to Mount Hood? Part of the Mount Hood National Park Campaign concept calls for repurposing some of the thousands of miles of failing, obsolete logging roads in the Mount Hood National Forest into scenic backroads or trails for hiking or biking. Most of these roads were constructed during the industrial logging heyday from the 1950s through the late 1980s, and were solely designed around clear cuts, not a concern for the respecting landscape or taking in the scenery. But a few of these roads date back to an earlier era, when the first few roads connected major destinations in the new Mount Hood National Forest in the 1920s and early 1930s. These roads were often built without machinery, and subsequently follow the contours of the land in a way that roads from the industrial logging era rarely do. One such historic forest road connects High Prairie and Lookout Mountain, located 8 miles due east of Mount Hood, to Bennett Pass, on the southeast shoulder of the mountain. For travelers of the Mount Hood Loop Highway, the old route follows the high ridges that form the wall of the East Fork Hood River valley, as you descend from Bennett Pass toward Hood River. Today, the historic Bennett Pass Road is a bumpy, often grinding minefield to navigate. It’s hard to imagine that it was the main forest route when it was built, but it still passes some of the finest scenery in the area along the way, and has the potential to be an exceptional scenic backroad. When it was built in the early 1930s, the historic road followed the route of an early forest trail along the ridge that connects Bennett Pass to a Forest Service guard station that once stood at High Prairie (if you know where to look, you can still find the ruins). The road was built by the Civilian Conservation Corps (CCC) in the early 1930s by crews based in Camp Friend, located to the east of Lookout Mountain, and just south of the town of Dufur. The Camp Friend crews also built several lookouts in the area and the historic road to Flag Point. Today, the historic Bennett Pass Road serves as the western boundary for the Badger Creek Wilderness and the northern boundary for the White River Unit of the Mount Hood National Recreation area. This easy proximity to both of these protected areas brings a string of fine trail opportunities along the route for exploring nearby viewpoints, lakes and meadows on foot. The northern section of the historic Bennett Pass Road, from High Prairie to Dufur Mill Road, was bypassed and decommissioned in the late 1980s when the newer, gravel-surfaced road to High Prairie was constructed. For the purpose of the Bennett Pass Historic Backroad concept, this newer section is included in the proposal, with the Dufur Mill Road junction serving as the starting point for the backroad tour and Bennett Pass as the end point. How would it be different? 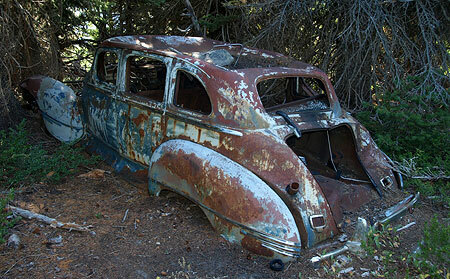 How would the Bennett Pass Historic Backroad differ from what is on the ground today? First, it would be one-way from High Prairie to Bennett Pass, the historic section of the original road that still survives. Like Titus Canyon, this portion of Bennett Pass Road has a few spots where passing an oncoming vehicle would by physically impossible – notably below Lookout Mountain and along a notorious stretch etched into a cliff known as the Terrible Traverse. But like Titus Canyon, the purpose of the one-way tour is mainly to allow for a greater sense of remoteness and ability to truly appreciate the rugged scenery along the way. Second, the concept of a scenic backroad also includes ADA-compliant picnic and restroom facilities along the way to ensure that all visitors can enjoy the tour. As our population ages and our society becomes more socially inclusive of those with limited mobility, providing accessible alternatives for exploring our public lands has become a critical, largely unmet need. Some of these facilities are already in place at existing trailheads and could be made accessible with modest improvements. Other spots along the route would need these basic improvements. Finally, a 10-mph speed limit would ensure that the proposed Bennett Pass Historic Backroad tour remains focused on users looking for a relaxing, scenic way to enjoy the area. This means that OHV users accustomed to traveling at greater speeds would need to find other places to make noise and disturb other forest visitors — and besides, the Forest Service has set aside areas for OHVs elsewhere in the forest. Today, it’s hard to get much beyond 5-mph in many sections of the Bennett Pass Road due to a profound lack of maintenance, so a light upgrade to the surface and periodic maintenance is part of the concept. In the 1980s, I navigated Titus Canyon Road in a Honda Civic, and there’s no reason why a better maintained Bennett Pass Road couldn’t accommodate passenger cars traveling at 10 mph. That’s part of being inclusive, after all. Signage is deficient or completely absent along much of the route today, so the backroad concept also calls for improved directional signage and occasional interpretive signage along the tour, as well. Interpretive signage could be as simple as mileposts that link to a downloadable PDF or podcast describing the rich natural and cultural history of the area. The full tour covers just over 14 miles, but at 10-mph with a few stops along the way, the Bennett Pass Historic Backroad tour would take the average family two or three hours to complete. Add an hour on each end to reach the tour from Portland, and this would make an exceptional choice for urban visitors looking for a new way to explore Mount Hood country. But by all means, please click here for a very large version of the map to see the details that make up this proposal. 0.0 to 2.8 mi. – Dufur Mill Road to Sunrise Rocks – The tour starts at gravel Lookout Mountain Road (Road 4410) where it begins on paved Dufur Mill Road (Highway 44), north of Lookout Mountain. This is the section of the route built in the 1980s to bypass a (now abandoned) portion of the historic road. After climbing through forest and passing pretty Horkelia Meadow, this segment ends at the mostly unknown Sunrise Rocks, a fine, currently undeveloped picnic spot with a commanding view of Mount Hood, across the East Fork Hood River valley. The Bennett Pass Historic Backroad concept (see map) also calls for a new trail in the area, from the Little John winter recreation area to Sunrise Rocks, providing another way to enjoy this overlook for hikers looking for a challenge and a year-round purpose for the Little John trailhead. Sunrise Rocks from the Little John trailhead and parking area… someday a trail from here? 2.8 to 4.9 mi. – Sunrise Rocks to High Prairie – after taking in the view at Sunrise Rocks, the route continues for another 2 miles along the newer road section to High Prairie, a major destination for hikers and equestrians. Families looking for a picnic or short hike can explore the sprawling meadows here, or take the longer 5-mile loop to the airy summit of Lookout Mountain, where the view stretches up and down the Cascades and into the high desert country of Eastern Oregon. 4.9 to 7.2 mi. – High Prairie to Gunsight Ridge – two-way travel ends at High Prairie in the historic backroad concept, and from this point forward the tour would be one-way toward Bennett Pass along the surviving, original section of the historic Bennett Pass Road. The segment of original road from High Prairie to Gunsight Ridge is the most breathtaking on the tour, with huge views of Mount Hood and exposed sections where drivers will be gripping the wheel — and taking in the views. Several scenic pullouts are located along this section, as well as a major trailhead at Gumjuwac Saddle, with trails heading in five directions! Hiking options from the saddle include longer trips to Badger Lake and Lookout Mountain, or the nearby Gumjuwac Overlook, just 0.8 miles from the saddle. The proposed Gunsight Ridge picnic area would be located at a large pullout above pretty Jean Lake, with access to the Gunsight Trail. Jean Lake can be visited via a family-friendly 0.6 mile trail that descends to the lake. 7.2 to 9.0 mi. – Gunsight Ridge to Camp Windy – the short drive from Gunsight Ridge to Camp Windy is just below the ridge crest, with frequent views into the Badger Creek Wilderness, and later, into the White River unit of the Mount Hood National Recreation Area. Modest picnic facilities and a vintage toilet already exist at Camp Windy, a lovely mountainside meadow, but new facilities would be needed as part of the scenic backroad concept. A short spur road here provides access to the Badger Saddle trailhead, and the 3.5-mile round trip hike to Badger Lake. 9.0 to 10.1 mi. – Camp Windy to Bonney Junction – From Camp Windy, the historic road continues to a 3-way junction with Bonney Meadows Road (Road 4891). 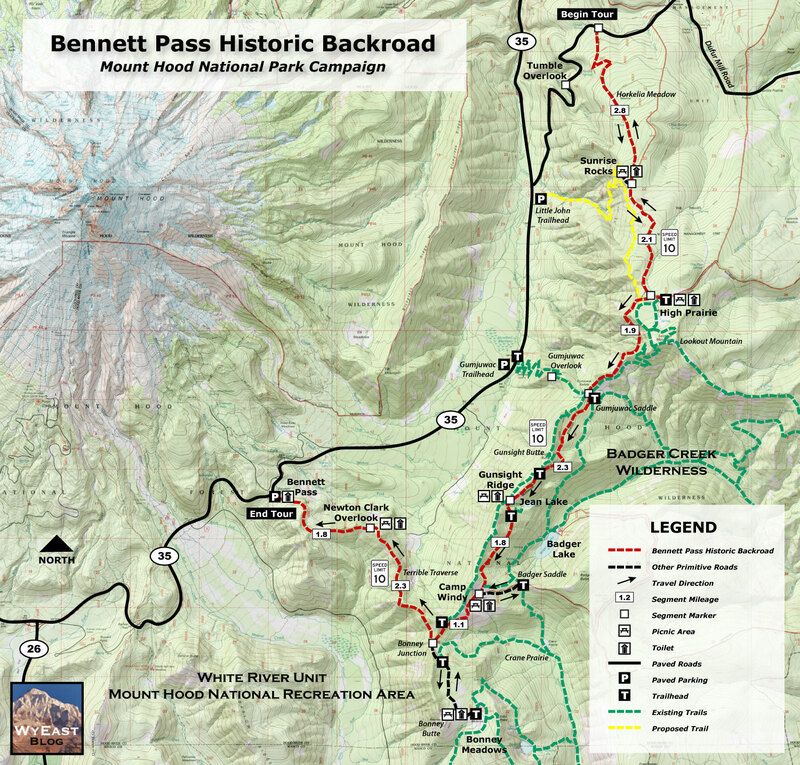 The historic backroad concept calls for the Bonney Meadows route to function as a 2-way facility, allowing access to the Bennett Pass Historic Backroad at its midpoint, and for Bennett Pass visitors to make side trips to Bonney Meadows and Bonney Butte, just off the Bennett Pass tour. Bonney Meadows already has a rustic campground perfect for picnics and exploring the nearby meadows. Families looking for something more challenging can make the 4.5 mile round-trip hike to exceptionally scenic Boulder Lake, or try a shorter hike to Bonney Butte, known for its raptor surveys. Bonney Meadows also has several developed campsites, so families could opt to camp here, midway through the tour. 10.1 to 12.4 mi. 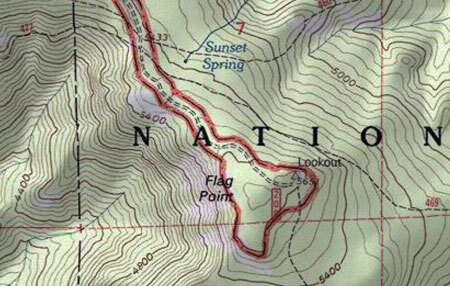 – Bonney Junction to Newton Clark Overlook – from Bonney Junction, the historic Bennett Pass Road turns abruptly north and descends briefly before arriving at a catwalk section of road carved into the crest of the ridge. Here, the tour passes the Terrible Traverse, marked by an extraordinary rock gateway cut by the early road builders. This is the Titus Canyon equivalent for the Bennett Pass Road, as there is no room for passing (or error) along this section! Just beyond the traverse, the road drops to a saddle with an excellent view of Mount Hood at the proposed Newton Clark overlook and picnic site. This spot is also one of several backcountry lodge locations proposed in the Mount Hood National Park Campaign to allow for Euro-style chalet-to-chalet trekking. These modest lodges would be rustic and quiet, along the lines of Cloud Cap Inn, and open year-round to also serve Nordic skiers and snowshoers. 12.4 to 14.2 mi. – Newton Clark Overlook to Bennett Pass – from Newton Clark Overlook, the remainder of the route continues along the ridge top through handsome stands of noble fir to the large trailhead and parking area at Bennett Pass, ending the tour. While some of the proposals featured in this blog are notably ambitions, this one is pretty simple, and could be accomplished in the near-term. The Forest Service would need to do some grading, add some gravel in some sections and step up maintenance of the historic Bennett Pass Road. Picnic and toilet facilities would need to be added in a few spots and new signage to help visitors navigate and appreciate the tour would be needed. Establishing a one-way route would be a taller order for the Forest Service, but there are already a few limited one-way routes along forest roads, so the idea is not without precedent. One obvious exception to a one-way rule is for emergency access, of course, but other visitors would probably appreciate the peace of mind in knowing they won’t meet another vehicle at the blind curve midway along the Terrible Traverse! The road is generally only open in summer, from mid-June through early October. The best time to visit is in July, when wildflowers are blooming throughout the tour, and the worst time is after heavy rain, when a few muddy sections might just swallow your vehicle. Parts of the historic portion of the road are very, very rough. Until a Bennett Pass Historic Backroad brings some surface improvements and periodic maintenance to this old route, plan on a slow, sometimes jarring ride that will test your nerves, tires and suspension. High clearance vehicles with AWD or 4WD, only! This collage of scraped rocks on Bennett Pass Road is mute testimony to the folly of taking a passenger vehicle there – don’t try it! The roads are poorly signed, so you’ll need a forest map. I recommend the National Geographic map for Mount Hood National Forest in their Trails Illustrated series. Never trust a GPS device or smart phone to navigate forest roads! With these precautions in mind, the old Bennett Pass Road is fun to explore and always un-crowded. Take it slow and enjoy the ride! In the early days at the turn of the 20th Century, the U.S. Forest Service was primarily a security force, tasked with guarding our public lands from timber thieves and squatters. This role expanded to include fire suppression in the early 1900s, a move that we see today as ecologically disastrous, but at the time, responded to massive fires destroying living trees that were valued in board feet, not biology. The most enduring legacy from this era was the construction of thousands of fire lookouts, hundreds of forest guard stations and a sprawling network connecting trails and primitive dirt roads. Though the lookouts and guard stations are mostly gone, the trail network still survives as the backbone of today’s recreation trail system. 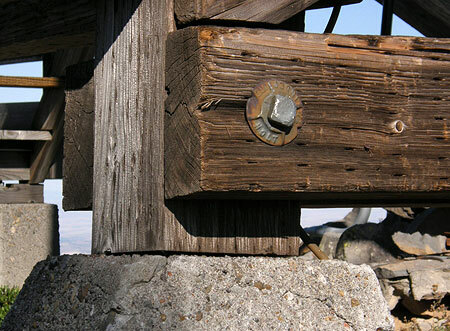 A few trails still lead to surviving lookouts scattered across the country. This article describes one such survivor, the Flag Point Lookout, located at 5,636 feet on a rocky, flat-topped bluff two miles east of Lookout Mountain. 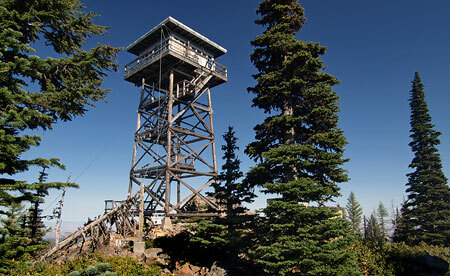 The Flag Point Lookout is unique in that it continues to serve as an active fire lookout during the summer. The view from the lookout surveys a broad sweep of the eastern slopes of Lookout Mountain, far into the Eastern Oregon sagebrush and ranchland, and south into the rugged Badger Creek Wilderness. Since the establishment of the Badger Creek Wilderness in 1984, The Flag Point lookout and the long, rugged 1930s-era dirt road leading to it have been surrounded on three sides by federally protected wilderness (The same 1984 legislation left two other surviving lookouts in the Mount Hood area, the Devils Peak and Bull of the Woods towers, inside new wilderness areas, where they are now maintained by volunteers as hiking destinations). 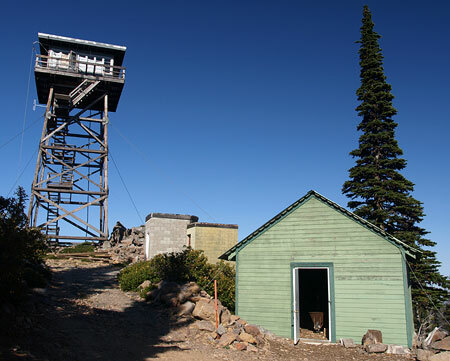 The first lookout structure at Flag Point was a six-foot square cabin on a 40-foot pole tower, built in 1924. 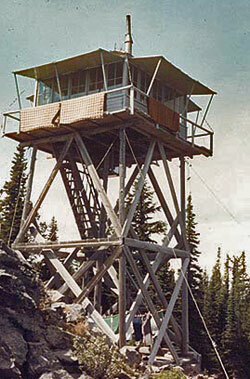 It must have been terrifying in rough conditions, and was soon replaced with the popular L-4 style cabin (pictured above) on a 30-foot pole tower in 1932, a design that was found across Oregon. Later improvements to the second tower were made in 1955, and a series of outbuildings were added over the years, replacing the original tent camp that accompanied the first structure. In 1973, the third and current lookout structure was built — an R-6 flat top cabin on a 41-foot tower constructed of sturdy, pressure-treated cross-timbers. Like many lookouts, the structure is primarily held in place by stay cables, and simply rests upon its four concrete foundation feet. Though the current structure is still too young to be listed on the National Historic Register, it has been listed on the National Lookout Register. It will become eligible for the historic register in just 13 years, in 2023. The Flag Point Lookout is also notable for the remarkable forest ecosystem that surrounds it, where stands of fir and mountain hemlock blend with western larch and ponderosa as east meets west. The rain shadow effect of the Cascade Range is plainly visible from Flag Point, where the sweeping view extends far into the sagebrush deserts of Eastern Oregon. Ironically, these are fire forests, an ecosystem that has specifically evolved around wildfire cycles, and thus have suffered greatly from the well-intended “protection” from fire that the lookouts have provided. Today, natural fires in the Badger Creek Wilderness are likely to be allowed to burn, with the Forest Service intervening only when homes or private property outside the wilderness are threatened. Beneath the forest canopy, the wildflowers of Flag Point are as diverse as the conifers, with mountain and desert species mingling in the sunny, open meadows. The Divide Trail, connecting Flag Point to Lookout Mountain, provides one of the best wildflower hikes in the region in early summer, traversing through miles of meadows and rock gardens along the way. Flag Point was an important forest destination in its time, and still serves as the hub for several forest trails that are a legacy of the early lookout era. In addition to the Divide Trail, the lookout has trails radiating to Ball Point, Gordon Butte and Badger Creek. Today, most visitors to the lookout arrive via the access road, but hikers and horse packers also regularly visit the lookout from this network of wilderness trails. 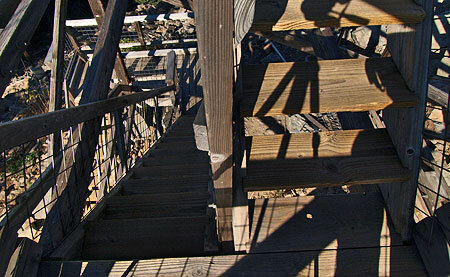 The cabin atop the Flag Point lookout consists of a 14-by-14 foot interior, surrounded by an airy exterior catwalk. Steel mesh fills the gap between catwalk railings, adding some degree of confidence for vertiginous visitors. The small cabin is furnished with a bed, a wood stove for heat, gas cook stove, table and chair, and a solar lighting system — a modern amenity that early lookouts couldn’t have imagined. At the center of the cabin is a map table that echoes the original Osborne fire finders used to pinpoint fire locations. 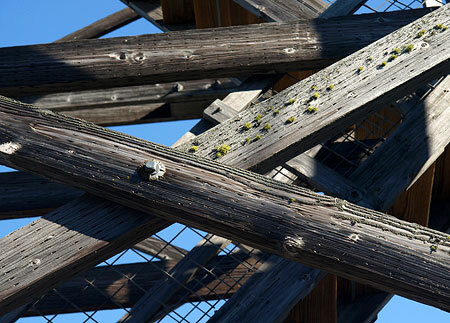 Outside, a rope and pulley system is used to haul supplies and firewood to the catwalk from the base of the tower. Water for drinking, cooking and washing must be hauled in to the tower by truck, though early lookouts simply carried water from the nearby Sunrise and Sunset springs. Outbuildings include an outhouse, woodshed and an A-frame communications shack has been added to the west of the tower. Anyone can visit the Flag Point Lookout by simply parking at the locked gate, and hiking about one quarter mile to the lookout complex. The tower is generally staffed from June 1 through October 15, so be courteous and let the lookout know you’re visiting before climbing the tower. If you’re lucky, the lookout will be on site and invite you up for a tour. If the tower is closed, you can still climb to the lower catwalk for a close-up look at the structure, and views of the surrounding terrain. The Flag Point lookout also makes for an interesting add-on to the Divide Trail hike to Lookout Mountain. You can simply hike to the lookout along the Flag Point Road from the Divide Trail (about 3/4 mile each way), or shuttle your car to the gate, saving about a mile of road hiking, round-trip. 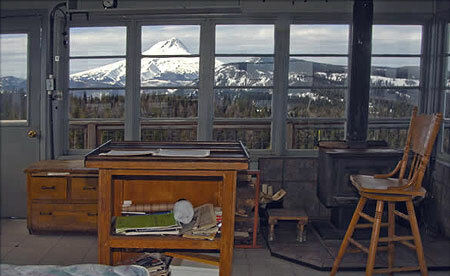 In winter, the Forest Service rents the lookout cabin to skiers looking for a rugged, remote experience. Of the handful of lookouts open as winter rentals, the Flag Point Lookout is one of the most challenging to reach. 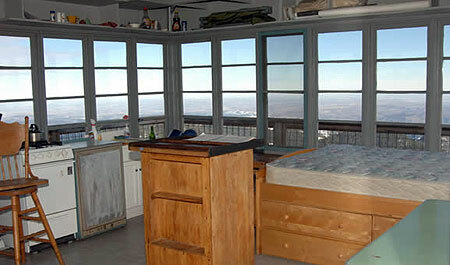 You can learn more about winter rentals at the lookout here. Reaching the lookout is an adventure in its own right. The last few miles of forest roads are generally open from June through October. From Portland, drive east on US 26 through Government Camp, then follow Highway 35 across the White River, and down the East Fork Hood River valley, beyond the Meadows ski resort. Turn east (right) on Road 44, where signs point to Dufur and Camp Baldwin, and follow this paved road for 8 miles to the poorly marked junction with Road 4420. Turn south (right) and follow this paved forest road as it eventually curves past the Fifteenmile Campground. Just beyond the sharp bend at the campground, watch for dirt road No. 200, heading abruptly uphill and to the right. This is the Flag Point road, and it bumps along for the next 3.5 miles to the lookout gate. Parking is available near the gate. Note: unfortunately, the Forest Service has recently ditched this road with a series of water bars that make for very slow going, and make the trip a rough ride for passenger vehicles – take it slowly!